On sunday I found I had some spare time to visit debenhams in Bath. I stopped off at the Benefit counter to have a look at some of the products I have been curious about.Until Sunday I had never used any Benefit products, I had always admired the pretty packaging and range of products from afar. The young woman on the counter was really helpful and lovely. She was very happy to answer my questions,show me the products and give her recommendations. So for customer service I have to give Benefit 10/10. 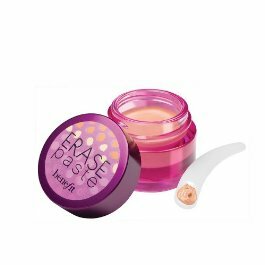 I was able to try out the erase paste in shade 01.
benefit say This concentrated, creamy concealer brightens and camouflages in one easy step! Targets dark circles, discoloration and imperfections. It went on easily, only a small amount was used and it didn't feel heavy on my skin. I originally thought that £18.50 for the size of the pot was very expensive but given how much you need I think it is a fair price. benefit say Our defiantly different tinted moisturizer gives your complexion coverage, moisture and SPF protection all in one. For fair-skinned rebels. Like with the erase paste, less is definitely more and I think that a tube of this will last quite awhile so the price at £21.50 is reasonable. Another great thing about this product is that it has an SPF (15). benefit say swirl the 4 flattering shades of peach, soft plum, shimmering pink and rose powders together and sweep on cheeks for a sweet rush of gorgeous. It gives such a lovely glow and the 4 shades work very well together without being too extreme. benefit say Quickly minimize the appearance of pores! Apply this silky, lightweight balm for translucent pore coverage and smoother-than-smooth skin. Pores... now you see 'em, now you don't! I think this was my favourite product the results are great and it is well worth the £23.50. What are your favourite benefit products ? Images credits - Benefit website.